Select for the Taking Care of Myself: A Guide for When I Leave the Hospital, a booklet for patients based on the RED Toolkit. What Are the Components of the After Hospital Care Plan? What Is the Patient Information Workbook and the RED Workstation? Is the RED Being Delivered to Target Patients? Is the Correct Information Being Collected? Is Evidence-Based Care Being Delivered? Is Appropriate Followup Care Being Arranged? Are Patients Being Prepared for Discharge? Are Patients Receiving Postdischarge Care? 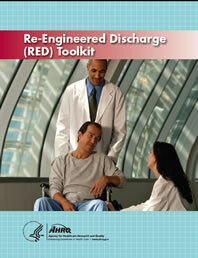 To augment the Re-Engineered Discharge Toolkit, Carol Levine and Jennifer Rutberg of United Hospital Fund and Brian Jack and Ramon Cancino of Boston University School of Medicine have developed Tool 7: Understanding and Enhancing the Role of Family Caregivers in the Re-Engineered Discharge (PDF, 428.5 KB). The authors of this guide are responsible for its content. The opinions expressed in this document are those of the authors and do not reflect the official position of the Agency for Healthcare Research and Quality or the U.S. Department of Health and Human Services. Statements in the guide should not be construed as endorsement by the Agency for Healthcare Research and Quality or the U.S. Department of Health and Human Services. We would also like to thank the hospitals who implemented the RED using an earlier version of this toolkit and provided insights that were used in finalizing the toolkit. Finally, we thank Carol VanDuesen Lukas, EdD, and Sally Holmes, MBA, from the Boston University School of Public Health for conducting interviews and compiling lessons learned.